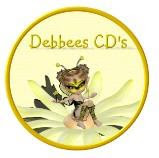 Hey there, this week is sponsor week over at CD Sunday, and our sponsor is debbees cds who have been very generous and kindly donated a prize of the Bryony Bee CD, which I'm told is a rare CD and not available for purchase, what a shame I can't enter this. The DT were given some images from Debees sets, after seeing Nancy Watt make a double twisted easel card a couple of weeks ago I decided to have a play for a slightly different shape and this what I came up with. As well as Debees Images and Backing Paper I used some red mirri, made my flowers using a Marianne Dies, some ribbon from and faux brads from my stash. lady bugs crafts - card-for-child. I like your an unusual shape - it looks fantastic. Very impressed wih the double easel card. Looks extremely complicated! Like your vibrant colours and the flowers are lovely. Wow Wendy what a stunning creation.I wouldn'nt know where to start on one of these. Thanks for sharing with us at LCI this week. Opps thanks for joining us at StampFairy this week too. what an unusual design.. really creative. WOW! What a fabulous creation! I love all the details. Thank you for sharing with us at Whoopsi Daisy challenge this week. Hope to see you again next week. Wendy, your Easel Card is doubly beautiful. So creative with your different shaped Easels this week. I love the flowers you made, they are incredible. Thank you for sharing this with us at MelJens Fun Fold Challenge. Wow, I thought easel cards were fabulous, but this DOUBLE easel card is just AMAZING! Thanks so much for playin' along with us this week for the Catch The Bug "Anything Goes" Challenge with Bugaboo Stamps! Great project , thank you for joining us at CRAFT Challenge this week and good luck! Don't forget to check back with us again on Thursday for our new challenge and to check if you have won or made our Top3. Oh so creative and unique! I'm just in awe as to how you've done this. Certainly is a one of a kind project - fantastic. Thanks for sharing it with us at StampFairy this week. Hope you'll play with us again. Very clever! Thanks for playing with Speedy's Friends! Wow, this is gorgeous... I'm going to have to check into this type of technique/card Love that mirri card stock and the overall shape of the card. Beautiful. Thanks for joining us at The Sisterhood of Crafters. This is such a cool project. I love it. It makes the CD card looks so fun and cool. So pretty! Thanks for joining us at Flutter By Wednesday! Wow, these double easels are getting popular! This is just beautiful! I love the images and the great red paper! You certainly are busy in your craft room Wendy! 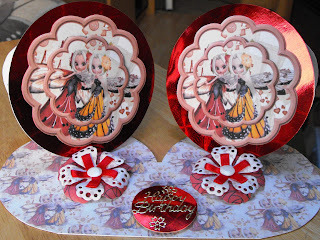 Wonderful circle easel cards, your designs are so sweet. Thank you so much for joining us in our Unique Fold challenge at Claudia & Co. this week. Very sweet Wendy! So original! Thx for sharing with us at Ladybug Crafts Ink! What a beautiful creation.I love those images and the circle idea is wonderful. Thanks for playing with us this week at Going Grey with Scrap-Creations and Good Luck! So very creative- looks like it was a lot of work for this one! Thank you for playing along with Speedy's Friends! wow... this is awesome... doubled easel card... would have never thought of it.. great job! Thank you for joining us this week on the MELJENS Design challenge. Good Luck! fab cards and fabulous flowers too ! ok, this is only my 3rd try to leave a comment :-) i am so intimidated by easel cards so you can imagine my jaw drop when i saw yours. absolutely gorgeous. love the flowers and the unique shape of the card. thanks so much for playing along with us in the sisterhood of crafters. A pretty card. Lovely colors and cute image. Thank you for joining us at Catch the Bug Challenge blog for our February Anything Goes Challenge! Thanks also for using a Bugaboo image! Good luck! What an unusual shape. Very different. Thanks for flying along with Delightful Challenges this week! Great project!! Thanks for joining us at Paper Sundaes and I hope you can join us next week!! Wow! What a different easel card! Thank you for joining us at Paper Sundaes - we hope to see you again soon!